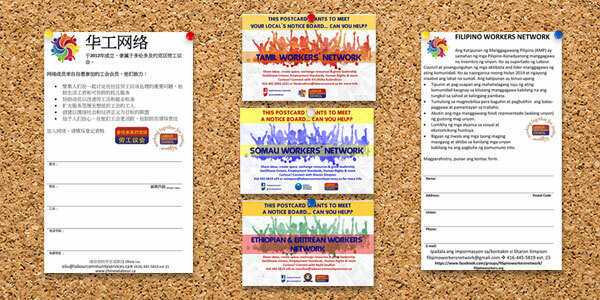 As part of its ongoing campaign to reach out to the different communities living and working in the GTA, the Diverse Workers Networks, with the support of the Toronto & York Region Labour Council, has created postcards and leaflets that it’s encouraging you to share with colleagues, friends, and neighbours. The Diverse Workers Networks is led by union activists and was formed to create a support structure for those whose first language is not English. The Network supports a variety of different GTA communities, including Chinese, Filipino, Tamil, Somali and Ethiopian/Eritrean. Use the links below to download the postcards and leaflets.